You are here: Home / How can we help? / News / How can we help? The College of Podiatry annual conference 2017 in Liverpool is just around the corner – you’ll find us at stand 117-118 in the exhibition hall. At the conference Firefly will be offering our unique take on 3D digital scanning for the prescription of custom made orthoses. You’ll find more on that here. You can find out how digital scanning can help you prescribe Richie Brace orthoses, more on that here too. 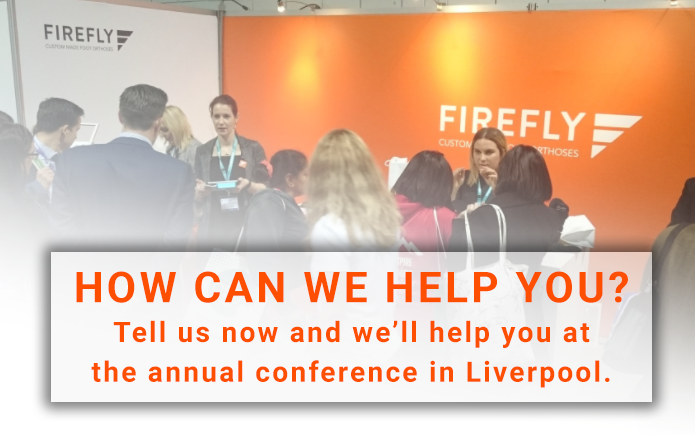 The Firefly stand is always busy at the COP Annual Conference but this year, we want to make sure your visit to the stand is as valuable and beneficial as possible. Hit the button below and tell us what would make prescribing custom made foot orthoses easier for you. We’ll then respond to you and arrange a time for you to meet one of the Firefly team face-to-face to solve your problem. How do I choose a top cover? What is cast dressing? When do podiatrists prescribe orthoses? What is an orthoses? There are no stupid questions – get in touch with us now as time at the conference is limited.